Content marketing is under reconstruction right now, and frankly, it has been for years. But there has always been junk. Currently, it’s just easier to find. It feels kind of dirty, like there’s a layer of filth that requires some serious Clorox Clean-Up. I know content marketing isn’t dead because it works on me every week. I buy from brands who publish smart articles. I subscribe to video channels that persuade me to pay attention to them. 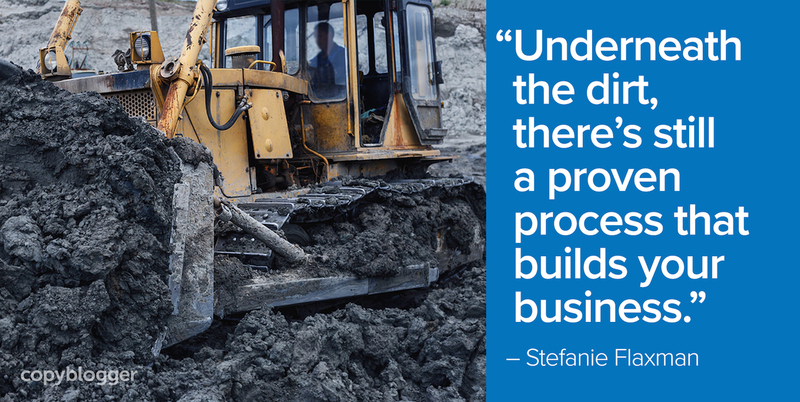 Underneath the dirt, there’s still a proven process that builds your business. As promised in this article’s headline, I want to highlight one factor that contributed to the current content marketing climate. It’s easy to put words together for a general group of people you want to attract. And technology makes it easy to publish online. So, all of this easy-to-produce, repetitive information exists on the internet, but the content doesn’t connect with anyone … potential audience members move on and the content creators are left thinking content marketing doesn’t work. Writing for specific people requires a lot more skill. It takes real research, real listening, real empathy, and real cojones … to publish over time and earn an audience’s attention. There’s no substitute for the creative momentum you get when you publish on a regular schedule. I like using the example of releasing new content once a week. It’s a model for focused content — a presentation your audience truly sees as a gift, something they look forward to getting. That’s the type of content worth publishing. Let’s say your ideal audience is “small business entrepreneurs.” I can think of a ton of typical information that would interest that group. Those are characters whose attention you aim to earn and whose needs you aim to serve. One piece of content won’t satisfy everyone in your audience, so that’s another reason why publishing on a set schedule is important. It gives you frequent opportunities to connect with different types of people. Who do you want to create content for this week? Your profiles for each character will outline their problems and the types of resources they’d prefer to have for help. For fun, let’s look at sample characteristics of what you might include for Charles and Colette’s personalities. He likes doing everything for his bespoke pastry business himself and doesn’t like hiring people. He writes engaging email autoresponders that nurture his prospects. He eats (tuna, BLT, chicken, etc.) sandwiches for lunch most days, sometimes while reading about garnish techniques. She wakes up at 6:00 a.m. and walks to a local coffee shop to socialize with other daily customers before she starts work. She loves collaborating in a team environment to grow her fashion-styling app. She enjoys taking her dog Nevil to a park in the early evenings. Charles Content and Colette Content may have some overlap since they both belong to the group “small business entrepreneurs,” but that’s a side effect of writing for a specific person. Avoid the temptation to be vague. One week could be for Charles … the next week could be for Colette … and so on, for the other characters you create. In your editorial calendar, keep track of who you’re serving, so that you speak to each character regularly, but there’s no need to be strict about it. For instance, if you happen to write for Cynthia two weeks in a row, you’re not necessarily neglecting the rest of your audience; Cynthia Content might be useful for Carl or Cedric, too. For more instructions on crafting different profiles for your ideal audience members, read and work through the exercises in: How to Attract Your Ideal Customer with Perfectly Positioned Content. You’ll use those details to make individuals feel your articles, podcast episodes, or videos were created just for them — because they were. Great tips for creating greast content for audience profiles, individualisation of content is only going to make sure it resonates. You’re right, content marketing like all other channels that gets abused by ‘spammers’ is going to have it’s opponents, just as those us that know how effective it can be when done right, will always sing its praises. This is such valuable information! The same is true if you are writing a book. Taking the time to determine and get to know your target audience on the deepest level possible helps you write the book’s content with those specific people in mind. This helps set the hook deeper and keep the reader engaged through to the ending, and looking for more. Thanks for sharing! Hi Stefanie, great reminders for me to get back to writing for one person. I’ve done it many times but not each and every time. This does help you delve deeper into something for that one person. That person who asked you a question about a topic you know a lot about. Content marketing has really changed over the years with so many new ways to do it via podcasts, video, clever infographics and instagram embeds, etc. Thanks for sharing these tips with us and have a great rest of the week Stephanie and Darren.